Australia officially known as the Commonwealth of Australia, is an Oceanian country comprising the mainland of the Australian continent, the island of Tasmania, and numerous smaller islands. This spider can ride the waves of the water while waiting for its prey. Some articles have joked that the reason Australia is surrounded by nothing but water is because "God is trying to protect you from the hell trapped within." After all, Australia is home to some of the world's deadliest animals - including spiders. The spider was named for Columbia University physicist Brian Greene, an homage to the animal's ability to detect and navigate by subtle waves in the water (waves are a fundamental phenomenon in physics). Brian the spider can, after all, ride waves as it uses vibrations on the surface of the water, or waves, to get around and catch its prey. The Brian spider is about the size of a palm and eats fish, frogs and tadpoles. Thankfully, their bite isn't dangerous to humans. 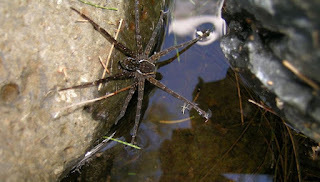 But it's still pretty unsettling to see a spider swimming along with you as you take a dip.